NAY PYI TAW, Myanmar On 21 March 2019, in the presence of State Counsellor Daw Aung San Suu Kyi, EU Ambassador Kristian Schmidt and Permanent Secretary of the Ministry of Planning and Finance U Tun Tun Naing officially launched the education budget support programme of the European Union (EU) in Myanmar. 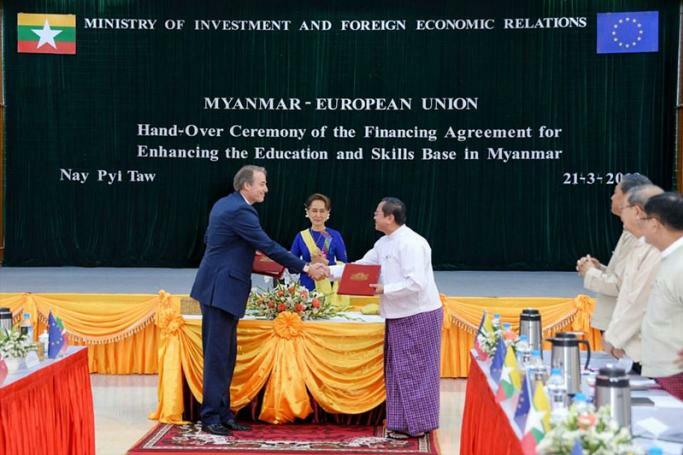 The EU’s support will contribute to equal access to better quality education for all students in Myanmar with EUR 221 million (more than MMK 380 billion), according to a statement. Between 2019 and 2022, the EU will provide EUR 175 million (more than MMK 300 billion), through direct financial transfers to the Ministry of Education budget, for the improvement of secondary education and technical and vocational education and training (TVET), as well as public finance management. A further EUR 46 million (MMK 80 billion) is allocated for technical expert assistance to the government in achieving these improvements. The EU programme will assist the implementation of core reforms in the National Education Strategic Plan 2016-2021, focusing on equal access to better quality secondary education and TVET. It will support the Ministry of Education in modernising curricula, teaching methods and assessment systems in secondary education and TVET, to ensure that they are more responsive to the needs of the labour market and to increase completion rates. It also aims at improving quality, transparency and accountability in the public finance management and budget oversight systems, to support more effective delivery of education services. In addition to the EUR 221 million education sector support, the EU will invest EUR 20 million (MMK 35 billion) to specifically improve access to quality education in ethnic areas. This will help strengthen the quality of services delivered by existing ethnic education systems and build their capacity for policy advocacy on education in the peace process. It will also promote a closer collaboration between the Government and non-governmental education providers.